In the United States the conventional left/right distinction has become increasingly irrelevant, if not harmful. The reigning political, cultural, and economic visions of both the Democrats and the Republicans have reached obvious dead ends. Liberalism, with its hostility to any limits, is collapsing. So-called Conservatism has abandoned all pretense of conserving anything at all. Both dominant parties seem fundamentally incapable of offering coherent solutions for the problems that beset us. In light of this intellectual, cultural, and political stalemate, there is a need for a new vision. 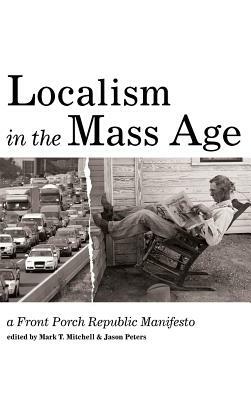 Localism in the Mass Age: A Front Porch Republic Manifesto assembles thirty-one essays by a variety of scholars and practitioners--associated with Front Porch Republic--seeking to articulate a new vision for a better future. The writers are convinced that human apprehension of the true, the good, and the beautiful is best realized within a dense web of meaningful family, neighborhood, and community relationships. These writers seek to advance human flourishing through the promotion of political decentralism, economic localism, and cultural regionalism. In short, Front Porch Republic is dedicated to renewing American culture by fostering the ideals necessary for strong communities. ""Why reorient our lives toward local communities, economies, farmlands and forests? Because that's where you can be a citizen rather than a consumer, where you can see a need and help to meet it, where kinfolk might gather not just to visit but to live, where flesh-and-blood neighbors can offer one another aid and companionship, where public officials must answer for their actions, where you can grow food when the trucks stop rolling, where sun and wind offer free energy, and where you can protect and restore a piece of Earth. If anything in that list appeals to you, then you'll be stirred by this book--a bold reimagining of our lives and our places."" --Scott Russell Sanders, author of Staying Put: Making a Home in a Restless World and other books ""If each of these essays is a gem--and it is--then coming upon them all in one place is what it must feel like to come upon a streak of emerald in a layer of shale. To find them embedded in one place, in a manifesto that is a paean to place itself, is a sight, and a site, for hope. Singly, they bring us--with equal parts humor, humility, and gravitas--to new vantage points from which to glimpse tantalizing glints of an alternative to today's creed of greed and gain. Together, they construct a non-military equivalent of a phalanx--with equal parts criticism, common sense, and ideals--against destruction of the particular local places and bonds that give us our lives. Only such patient words and intricately argued bridge-building can help us withstand the ravages of expansion without limits, exploitation without renewal, and social and political polarization without thoughts of perpetuity."" --Elisabeth Lasch-Quinn, Syracuse University, author of Race Experts: How Racial Etiquette, Sensitivity Training, and New Age Therapy Hijacked the Civil Rights Revolution ""Among the few remaining signs of civilization these days is this smallish salon of wonderful writers and thinkers, the Porchers, as they call themselves. In well-tuned prose, they celebrate rootedness and that elusive notion, a sense of place. Not to mention, a sense of the truly human."" --Elias Crim, editor and founder, Solidarity Hall ""This is a book of serious ideas, well parsed, and rather brave considering the pervasive intellectual perversity elsewhere on the American scene. But mostly it is a lot of really good writing."" -- James Howard Kunstler, author of The Long Emergency and other books. ""For over 30 years we have heard lamentations from across the political spectrum about the decay of community. Most sound quaint now, for we have lost so much more than community. We've lost contact with reality as we move through an environment of abstract.